Can "one percent" bring art to streets beyond the national gallery? 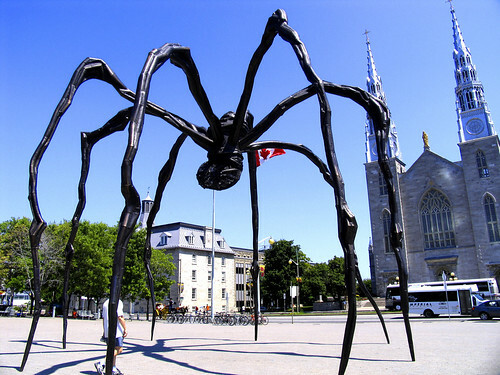 When you see public art projects on Ottawa streets, do you wonder how they get there? Who pays for it? For example, the Community Design Plan for the Wellington West road reconstruction has a $25+ million price tag for capital improvement. 1% of that budget, approx. $250,000, is intended for commissioned public art. Other such projects include Bank Street, Preston Street and in the future, streets like Sussex Drive. Does the 1% always get directed to public art? No, but 1% initiatives are becoming more visible due to the strength and persistence of Ottawa’s vocal community groups who are starting to hold the City to its funding policy. Right now percentage programs are in the spotlight. In the UK, the controversial Robin Hood Tax concept is hotly debated. The principle is easy: take from the rich and give to the poor. In corporate terms, it means: take a small percentage of the cost of transactions from a large, well-funded business and feed it back into the community. That small percentage makes a big difference, as we can see from the Wellington West example. What is important for government and business to understand is the cyclical nature of this concept. Whether the funds go back into the arts, the environment, social programming or poverty reduction —this should be a standard practice. People support government and big businesses that prioritize giving. They vote, promote, and invest in these groups, who in turn have more incentive to give. The truth is that something like public art is hard to organize and is seldom free. Someone pays for it. Someone makes it. Someone fights for the right to get it out there and make us look at it. Last November I wrote an article about the new Bank Street bike racks and what a significant difference it makes to have public art incorporated into the city’s street planning cost structure. Ottawans need to know that such percentage programs exist in our city and go to a good cause –civic enhancement. When we deal with our City officials we can make sure they know that we care about public art, and by doing so we can see to it that something as small as 1% is not conveniently forgotten.